I had my heart set on an entirely different post for today but the cold, rainy weather stomped on my plans. Who wants to read about a cold salad, no matter how good it is or how interesting the background story may be (at least in my mind), when it’s wet outside and all you want to do is curl up in front of the fire. I’ll save that post for another day. I decided to make something warm but leftovers in the refrigerator took dessert, a big pot of soup or a hearty main dish out of the equation. Instead, I opted for these gougéres. Cheese puffs are easy to make (so I say after conquering my gougére fear) and they are a nice accompaniment to wine before dinner. But I tried something different today. In addition to gruyére cheese, I also threw in some chopped olives and anchovies for a more savory punch. I realize that the inclusion of anchovies may not earn these a spot on your must-try list but I assure you, they’re quite good. After being teased by the cheesy, anchovy aromas coming out of the oven, the first bite will not disappoint. The crispy puffs lead the way for the sharp nuttiness of the gruyére then take your taste buds for a salty spin. Not too salty, though. Just enough to get a hint of the marinated olives and anchovies. The two don’t overpower at all but you know you’re enjoying a different kind of gougére when you bite into these. So would you try them? I encourage you to. If not, omitting the anchovies and substituting sun-dried tomatoes would work, too. By the way, you still have a chance to win my giveaway here. It’s been good to learn what people like (or dislike) about this blog. Someone recommended no more anchovy recipes and that made me smile. I think that would be a hopeless goal for me, don’t you think? 🙂 Still, I have appreciated everyone’s comments and suggestions. My request for your input was not meant to be a catalyst for a major shift in my blogging style but more to find out how to better organize my recipe lineup. Positive feedback and constructive criticism will always be welcome here and I want you to know that having you for an audience has been the best part about having this blog. So drop by my giveaway while there’s still time! I’ll be accepting comments until October 24. Fold the cheese, olives, anchovies, and garlic into the pastry. Use two spoons to form about 1 1/4 inch round balls and drop on the parchment-lined baking sheet. You will get between 25-30 puffs. Transfer the puffs to a basket and serve at once. These are just beautiful. You have such skill with the camera (and in the kitchen, of course) I loved how you arranged your gougeres spilling out of that basket. You made me want to spread out a blanket and enjoy a fall picnic. Thank you for sharing, and for your kind words on my blog. Oh boy! Do these look amazing! I need to try these soon. Can i stop by and get some? These amuse-guele with your personal touch are great !! Could you send me 50 via Fedex? Wow these look absolutely amazing! the photos are gorgeous! Yummy! I love olives and anchovies and I, too, have a fear of those gourges (see? I can’t even type them). 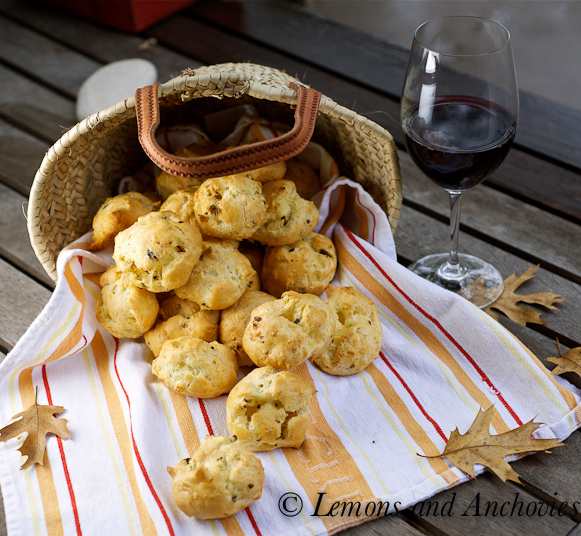 Absolutely gorgeous photos and these gougeres would be perfect for entertaining! Lovely photos and I love the idea of adding in olives to the gougéres perfect idea for the apéro ! I tend to mix in a few cheeses such as comte and beaufort into mine but will give this a shot. 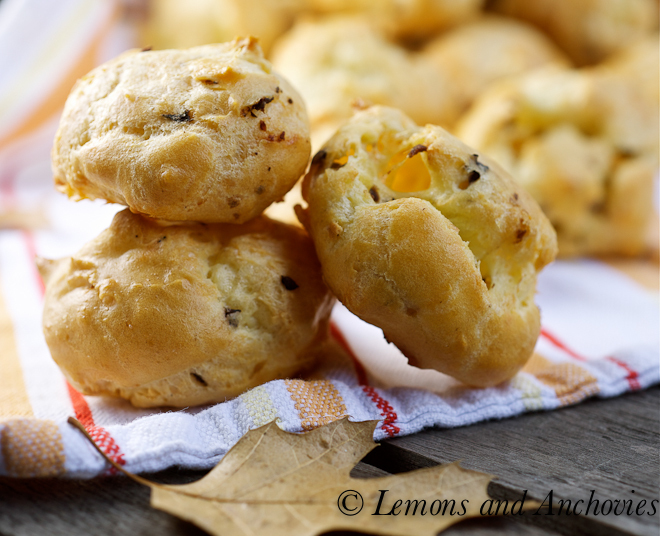 Those gougeres look lovely – beautiful photos! oh, i love a gougere. 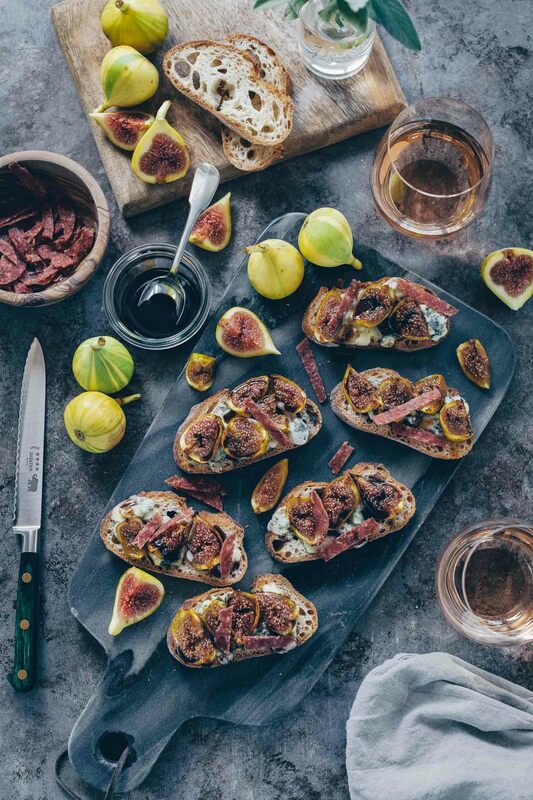 the perfect nibble with a glass of wine. and with anchovy? that’s just genius! Gougeres compel me to do a happy dance. love the extra savoriness in yours. 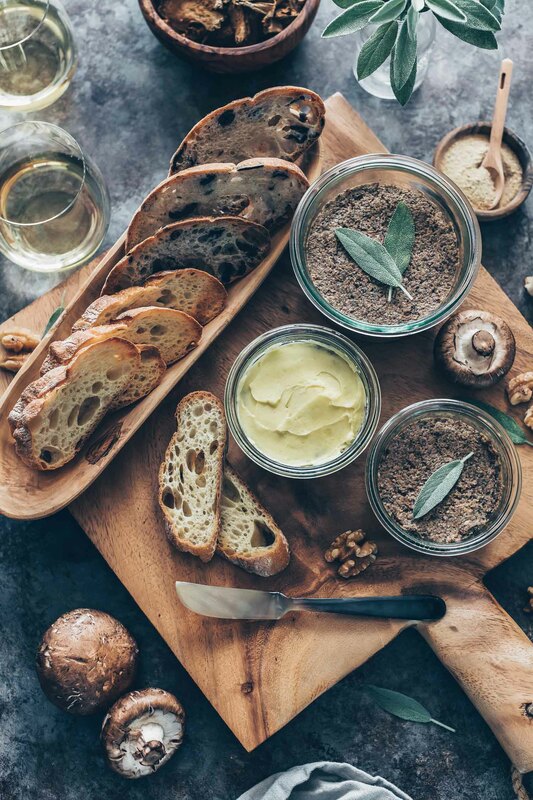 Jean – love how you incorporated fall into your photos along with keeping authentic to your love of anchovies! I love making gougeres and eating them even more. I think I may need whip up a batch tonight. Charles LOVES anchovies and would love to have eaten one that you made! Enjoy the rainy weekend with your hubby! Oh my, these look absolutely divine. 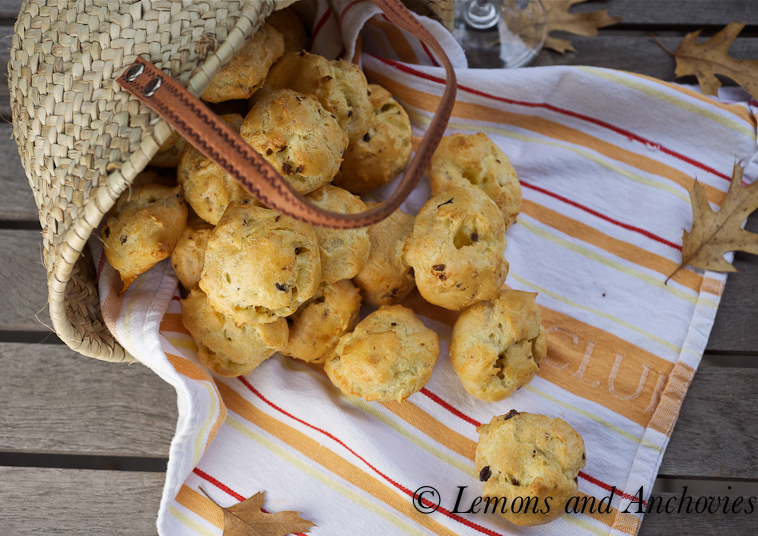 Love your photos, love the gougeres, love the basket, love reading your blog. By all means, anchovy-away in your cooking! After all, you gotta cook and eat what you love. 🙂 For those of us who don’t love anchovies, we’ll work around it. Heh. 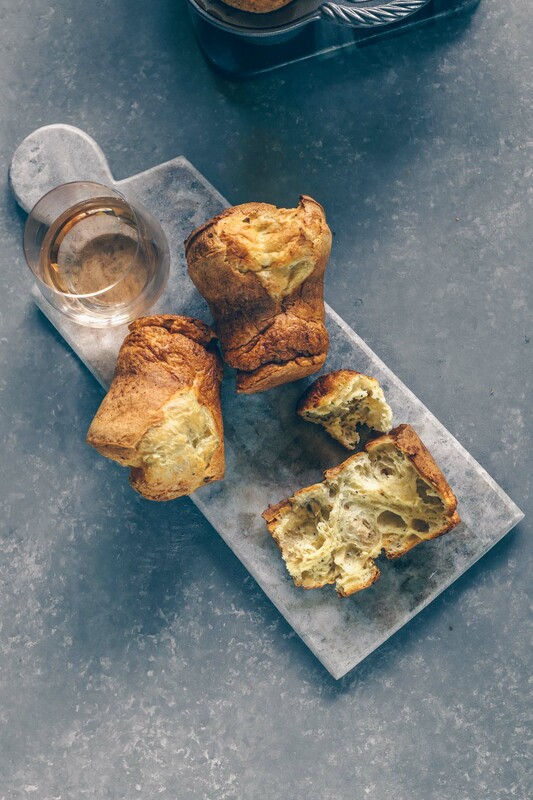 Your gougeres look light and delicious. Perfect for a cold day. Interesting combination that I must try. Thanks for the recipe. I want one now with a glass of wine!! 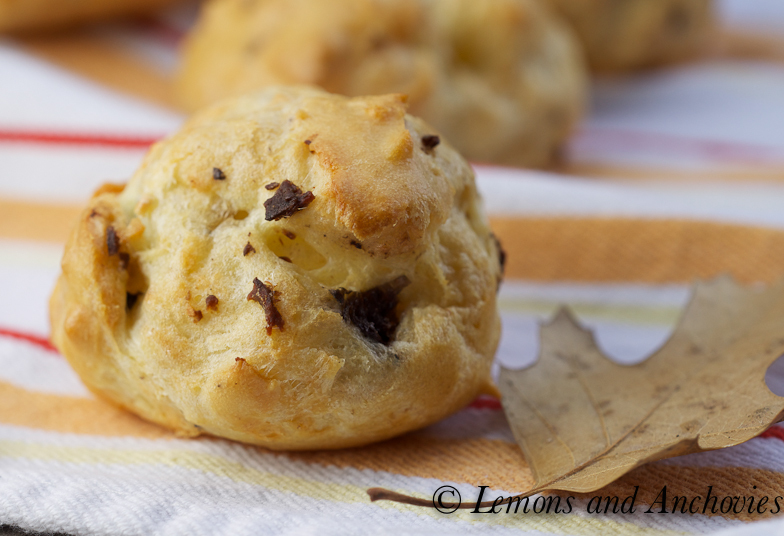 These gougeres look delicate and light. Except for the anchovies I think I have everything on hand to give these a try (I’d like to try it w/the anchovies too!). These look great with a warm bowl of soup, or salad and just as elegant for a party.